Many patients residing in the LTC setting are elderly and frail, with multimorbidity and limited life expectancy. Although research evaluating the impact of screening for breast, colorectal and prostate cancer in older adults in general and LTC residents in particular is scant, available studies suggest that multimorbidity and advancing age significantly alter the risk-benefit ratio. Preventive cancer screenings have both immediate and longer term risks (e.g., procedural and psychological risks, false positives, identification of cancer that may be clinically insignificant, treatment-related morbidity and mortality). Benefits of cancer screening occur only after a lag time of 10 years (colorectal or breast cancer) or more (prostate cancer). Patients with a life expectancy shorter than this lag time are less likely to benefit from screening. Discussing the lag time (“When will it help?”) with patients is at least as important as discussing the magnitude of any benefit (“How much will it help?”). Prostate cancer screening by prostate-specific antigen testing is not recommended for asymptomatic patients because of a lack of life-expectancy benefit. One-time screening for colorectal cancer in older adults who have never been screened may be cost-effective; however, it should not be considered after age 85 and for most LTC patients older than 75 the burdens of screening likely outweigh any benefits. 1–5: AMDA – The Society for Post -Acute and Long-Term Care Medicine convened a work group made up of members from the Clinical Practice Steering Committee (CPSC). Members of the CPSC include board certified geriatricians, certified medical directors, multi-facility medical directors, attending practitioners, physicians practicing in both office-based and nursing facility practice, physicians in rural, suburban and academic settings, those with university appointments, and more. It was important to AMDA that the workgroup chosen represent the core base of the AMDA membership. Ideas for the “five things” were solicited from the workgroup. Suggested elements were considered for appropriateness, relevance to the core of the specialty and opportunities to improve patient care. They were further refined to maximize impact and eliminate overlap, and then ranked in order of potential importance both for the specialty and for the public. A literature search was conducted to provide supporting evidence or refute the activities. The list was modified and a second round of selection of the refined list was sent to the workgroup for paring down to the final “top five” list. Finally, the work group chose its top five recommendations before submitting a final draft to the AMDA Executive Committee, which were then approved. 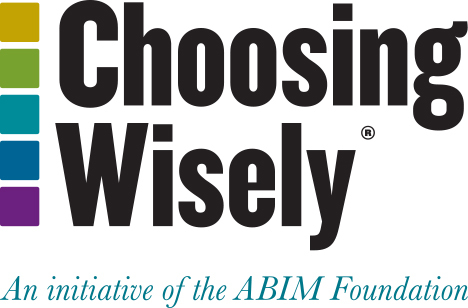 6–10: The AMDA Choosing Wisely® endeavor utilized a similar procedure as published in JAMA Intern Med. 2014;174(4):509-515 – A Top 5 List for Emergency Medicine for our five items. The AMDA Clinical Practice Committee acted as the Technical Expert Panel (TEP). Phase 1 – The Clinical Practice Steering Committee (CPSC) along with the Infection Advisory Committee clinicians brainstormed an initial list of low-value clinical decisions that are under control of PA/LTC physicians that were thought to have a potential for cost savings. Phase 2 – Each member of the CPSC selected five low-value tests considering the perceived contribution to cost (how commonly the item is ordered and the individual expense of the test/treatment/action), benefit of the item (scientific evidence to support use of the item in the literature or in guidelines); and highly actionable (use decided by PA/LTC clinicians only). Phase 3 – A survey was sent to all AMDA members. Statements were phrased as specific overuse statements by using the word “don’t,” thereby reflecting the action necessary to improve the value of care. Phase 4 – CPSC members reviewed survey results and chose the five items. For more information, visit www.paltc.org. Clarfield AM. Screening in frail older people: an ounce of prevention or a pound of trouble? J Am Geriatr Soc. 2010 Oct;58:2016-21. Gill TM. The central role of prognosis in clinical decision making. JAMA. 2012 Jan 11;307(2):199-200. Gross CP. Cancer screening in older persons: a new age of wonder. JAMA Intern Med. 2014 Oct;174(10):1565-7. Lee SJ, Leipzig RM, Walter LC. Incorporating lag time to benefit into prevention decision for older adults. JAMA. 2013 Dec (25);310(24):2609-10. Lonsdorp-Vogelaar I, Gulati R, Mariotto AB, Schechter CB, de Carvalho TM, Knudsen AB, van Ravesteyn NT, Heijnsdijk EA, Pabiniak C, van Ballegooijen M, Rutter CM, Kuntz KM, Feuer EJ, Etzioni R, de Koning HJ, Zauber AG, Mandelblatt JS. Personalizing age of cancer screening cessation based on comorbid conditions: model estimates of harms and benefits. Ann Intern Med. 2014 Jul 15;161(2):104-12. Moyer VA. Screening for prostate cancer: U.S. Preventive Services Task Force Recommendation Statement. Ann Intern Med. 2012 Jul 17;157(2):120-34. Royce TJ, Hendrix LH, Stokes WA, Allen IM, Chen RC. Cancer screening rates in individuals with different life expectancies. JAMA Intern Med. 2014 Oct;174(10):1558-65. Spivack B, Cefalu C, Kamel H, et al. Health Maintenance in the Long Term Care Setting Clinical Practice Guideline. 2012. Columbia, MD: American Medical Directors Association. van Hees F, Habbema JD, Meester RG, Lansdorp-Vogelaar I, van Ballegooijen M, Zauber AG. Should colorectal cancer screening be considered in elderly persons without previous screening? A cost-effectiveness analysis. Ann Intern Med. 2014 Jun 3;160(11):750-9. Walter LC, Covinsky KE. Cancer screening in elderly patients: a framework for individualized decision making. JAMA. 2001 Jun 6;285(21):2750-6.